Please refer to our stock # TR10025 when inquiring. These gorgeous earrings are just the thing for St. Patrick's Day or any other time you want to wear them. They are clip earrings in gold metal, and each one is 1" wide. 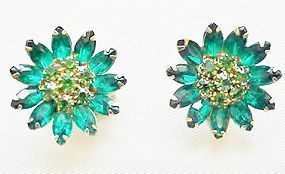 The large marquise green stones for the edge, and in the center of each is a cluster of small rhinestones the same color as the others. They are in excellent condition and they are not marked.